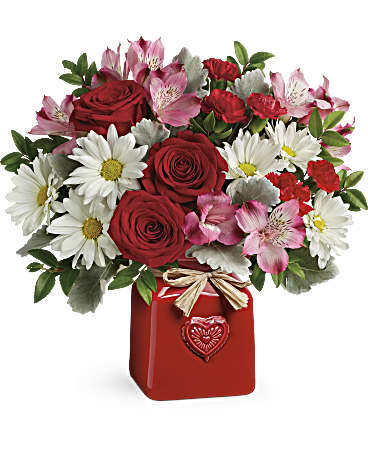 Make your sweetheart smile with this country-inspired bouquet! Radiant red roses and cute white daisies look oh-so charming in this retro ceramic crock with embossed heart and Italian raffia bow. This bouquet includes red roses, pink alstroemeria, red miniature carnations, white daisy spray chrysanthemums and dusty miller. Delivered in Teleflora's Country Sweetheart Crock.